You know about Keystone XL—but activists want you to know about the record number of dirty, dangerous pipelines springing up elsewhere that grassroots action might have the power to stop. I also learned something horrifying. Please allow me to share. You know something about tar sands, those petroleum deposits sedimented within mineral layers, concentrated in the Canadian province of Alberta. They can be converted into crude oil via a highly disruptive refining process, then transported to market via a process that is even more disruptive: overland and underwater pipelines. You know about tar sands, no doubt, because of the Keystone XL controversy. At Bioneers yesterday I attended a strategy session led by tar sands activists who were glad that the Keystone XL controversy has focused attention of the whole ghastly business; XL, because it crosses an international border, requires presidential action, which has provoked activists to launch a highly visible pressure campaign aimed at the White House. But they were worried about that attention, too—because “XL” serves a distraction from other, more proximate pipeline crises unfolding now, today, perhaps beneath a waterway or across a county near you, that you might be able to help stop now, through grassroots action. One of the most monumental reversal-and-construction projects is taking place on a 485-mile pipeline that used to transport petroleum drilled in the Gulf of Mexico to the Midwest—but beginning in the spring of 2012 began moving tar sand-derived crude from Cushing, Oklahoma (the “Pipeline Crossroads of the World”), to the Gulf Coast for transportation onto the world market (a key concept—the world market; none of this has anything to do with American “energy independence”). It’s called the Keystone Pipeline Gulf Coast Project, and it has been the obsession of one of the remarkable panelists I heard last weekend. Earl Hatley, a Native American from Oklahoma and legendary environmental activist, was a principal in a lawsuit, dismissed by a federal judge last month, to keep that monstrosity from being completed. An exceptionally experienced observer of the wicked ways of the corporate carbon cowboys now deforming the North American landscape, he offered some shrewd assessments of the current state of play based on what he learned from that process. The clever lawyers for the pipeline company TransCanada, you see, had devised a shifty way to get pipelines reversed, built or both, before opposition can have time to gel. They get a special kind of expedited permit from the Army Corps called “Nationwide Permit 12,” which is supposed to be limited to projects that disturb less than a half-acre of wetland in a “single and complete project.” But companies claim, in clear violation of the intent of the Clean Water Act and the National Environmental Policy Act, that each crossing of a body of water (there are more than a thousand for the project in question, adding up to 130 acres of high-quality forested wetlands) is a “separate” project, each falling below the threshold of scrutiny. That way they can avoid public hearings, avoid filing a environmental impact—can avoid any accountability at all, really. “It’s not a public process,” explains Hatley. (Nope. Only the lands are public.) Or, actually, processes—for what the NWP 12 scam allows is for pipeline companies to overwhelm the system, as the legal complaint from the Sierra Club and Clean Energy Future Oklaho ma explains, by “piecemealing” what is obviously a single project (even though you obviously can’t have a pipeline if it’s in pieces), “into several hundred 1/2-acre ‘projects’ so as to avoid the individual permit process.” So it is that Army Corps of Engineers, the named defendant in the suit, gets to mete out little chunks of permission every eleven miles or so, in secret, the public and the planet be damned. That’s right: the plain intent of US environmental law could be contravened because it would cost a corporation. A court actually said this. But look here: there is (as a certain presidential candidate used to like to say) hope. You can’t have a pipeline, after all, if it’s in pieces. What if We the People found a way to break the chain? To, as it were, perforate the pipe? 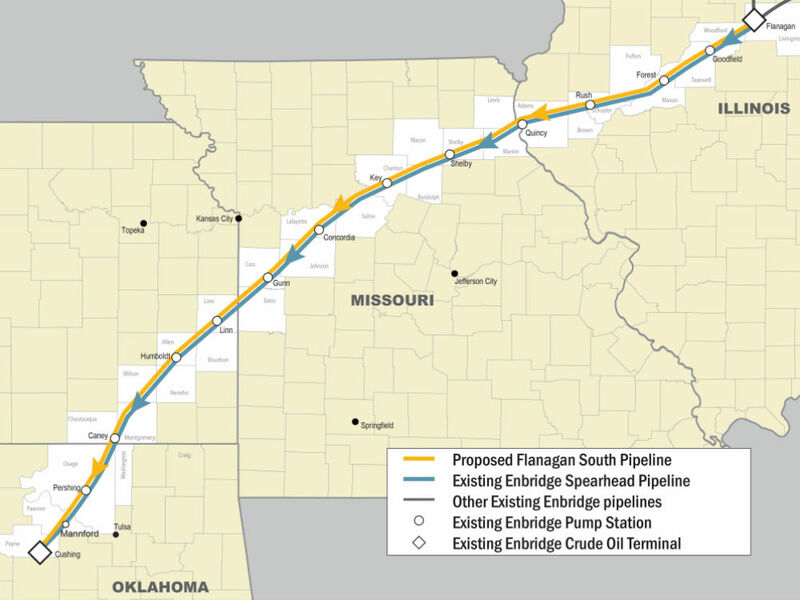 Those burgs that dot the map from Flanagan to Cushing: Caney and Humbolt and Lynn in Kansas; Gum and Concordia and Key and Shelby in Missouri; Goodfield and Florence and Rush and Quincy in Illinois—those are the towns Enbridge will be eyeing for colonization-via-fossil fuel pump stations and refiners. What will happen when the colonizers arrive? Hatley described his own observations from Oklahoma: arrogant out-of-town oil men will refuse to patronize local businesses, break promises to provide local jobs, condescend standoffishly to local citizens. “You go through the cafes…. You stand up, and you start having rallies. You let people know.” And, he said, people respond. Another panelist, MacDonald Stainsby, who is based in Vancouver, told an extraordinary story about the time he visited a village in Africa. The people there were amazed when he recited to them, as if he were a clairvoyant, exactly the history of double-dealing and mendacity and environmental abuse they’d suffered when an oil multinational came to town. How did he know? they asked. Because, he replied, that was exactly what they did to towns in Canada—and everywhere else. Which is why, Hatley explained, activists should try to “catch the process before it goes forward,” from the bottom up. That is where the hope lies. Organize with these facts from the pipeline-rupture epidemic, which have flown largely below the media radar. A Koch-owned pipeline spilled 400 barrels in Texas last week. “Details are scarce regarding the cause of the spill,” Alternet reports, but that’s nothing compared to what happened a few weeks earlier: “a pipeline that spewed over 20,000 barrels of crude oil into a North Dakota wheat field went unreported for eleven days until it was discovered by a farmer harvesting his wheat. A subsequent Associated Press investigation found nearly three hundred oil 300 oil spills and 750 oil field incidents have gone unreported in the state since January 2012 alone.” According to a report from the watchdogs at Public Employees for Environmental Responsibility, the office at the Department of Transportation in charge of regulating 2.6 million miles of pipeline spends three times more hours hobnobbing at industry conferences than it does responding to spills, explosions and other incidents on the ground. And last summer, the National Wildlife Federation sent divers down to inspect the sixty-year-old pipelines Enbridge operates beneath the Straits of Mackinac—a major tourist area in Michigan—after the company (and the federal government’s Pipeline Hazards Safety Administration) refused for two years to release information about their safety and integrity or even their location. You can watch the video here to see what they found: “pipelines suspended over the lakebed, some original supports broken away (indicating the presence of corrosion), and some sections of the suspended pipelines covered in large piles of unknown debris.” Among the cities with refiners that receive tar sands from this eminently admirable company, according to Clean Energy Future Oklahoma, are Joliet, Illinois; Whiting, Indiana; St. Paul, Minnesota; Toledo, Ohio (they have two); and Tulsa, Oklahoma. Enbridge began construction this summer on Flanagan South, using the obnoxious Nationwide Permit 12 process. The fact that you’ve heard of Keystone XL but not this, even though the route might nearly snuggle up to your front porch—it comes within twenty miles of Peoria, Illinois, to take one example—has nothing to do with size: according to Midwestern Energy News, the project will carry “600,000 barrels a day initially for the Flanagan South, and 783,000 barrels per day once combined with the Spearhead, an existing pipeline that largely runs parallel to the proposed Flanagan route,” compared to 830,000 barrels for Keystone XL. What liars. Sounds like a villain worthy of your most mighty attention. Zoe Carpenter highlights another under-reported environmental crisis: coal mining in the Powder River Basin.